Change your appointment Tahny…. December 3rd @ 8:30am has been my day to get my CT scan to check and see if my pulmonary embolisms are gone. This scheduled appointment sheet has been stuck to my refrigerator for 4 months. I look at it everyday thinking that day couldn’t get here fast enough. Then I get the opportunity to get it changed to November 20th @ 10:30. 4-5 months ago I would have jumped on that earlier change. But…..now it puts a tight turning knot in the pit of my stomach. Why? Why, aren’t I excited about this!? I guess, I didn’t realize how nervous I was. It’s funny how you think you’re ready and can’t wait for something and then the time arrives and you’re standing still in your tracks needing someone to give you a push forward. I remember feeling this way the day I got married. The “here comes the bride” song was being played on the piano, and the doors were about to be open for me to walk down that long aisle to this young man that I will now call my husband. The wedding coordinator was directing me towards the door that was shut to keep the bride secret until it was time for her big reveal. Then she said in a very exciting voice, “are you ready? !” My arm was hooked around my dads arm and I blurted out “NO! Don’t open those doors!” The piano player had to repeat the wedding march. I knew I wanted to marry Kent but I was scared of moving forward to the next chapter in my life. Then, my reliable father took me into another room privately and said, “Tahny, I love you and if you don’t want to do this you don’t have too. The money doesn’t matter and either does all those people out there. I will go and tell everyone that it’s off.” I stood there looking at my dad in shock thinking that was not what I expected to hear. Then dad asked me, “Tahny do you love Kent?” Without hesitation I said, “yes!” Then he asked me, “do you believe God put you two together?” Then the next thing I know, my dad is holding and patting my hand all the way down the aisle for me to say “yes” to the love of my life, Kent. You know even through all my nights of pain I would call out my dads name. I would wake myself up calling, “Dad! Dad! Dad, Help!” His would happen every night. Kent would just come and check on me, and I’d wonder if he even noticed what I was shouting. I finally asked him if he ever heard me yelling and crying out for my dad? He said, “of course I do.” I asked him if it made him annoyed or upset and he just said, why would it? Our earthly father & heavenly Father is a symbol of security and safety. Kent understood. After I came home from being diagnosed with PE’s from St. Joes, I was noticing extreme pain in my right side. Max was having his talent show that evening and I was determined not to miss it. I was video taping Max preform his “talent” of Tae Kwon Do and breaking boards. Max was so nervous and I was too for him! I sat there in so much pain barely being able to hold up the recorder but, still thinking I couldn’t imagine not being there. Max was finished and I handed the recorder back to Kent and said I have to go to the medplus, something is wrong. Dr. Leppert did a x-ray of my chest checking me for pneumonia. I didn’t have it. He did tell me what meds to take in hopes it would help. But, if it doesn’t get any better let him know ASAP. Well, the next day came and I couldn’t move. I fought to get to the phone to have grandpa come down and get Max on the bus. Max was already scared to have something else be wrong with me. I just tried my hardest to stand up tall and reassure him I was ok. I just told him I’m kinda hurting this morning but I’ll be fine. Then grandpa pulled in. Max looked at me and said, “I’m not leaving you mom, and I’m not going to school!” Then the bus pulled up to the driveway. I said, “I’m fine Max, I need you to get to school I love you so much!” I would call Max’s teacher to keep an eye on him and to be aware of what’s going on at home. I couldn’t walk up straight, I couldn’t breath. This was getting worse. Nellie was at my house too and I called Kent home. We went to the doctors without having an appointment. I walked in that office they looked at me and sent me back immediately to Dr. Leppert. I couldn’t talk, Kent did all the talking and explaining. I just sat there with my head down watching my tears leave wet polka dots on my jeans. I knew where I was headed. Dr. Leppert couldn’t even make eye contact with me. He has been through this whole journey with me since I first blew my back out. He knew the last thing I wanted to hear was, “Tahny you know where this is going right? I shook my head…yes. I had to get another CT scan. I knew I had to remove all metals. That meant my necklace. 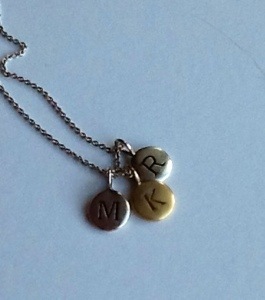 My necklace has the boys initials on it. I didn’t want to remove it. There was something about Kent removing my necklace in that crowded bathroom that made me break down in hysterical tears. My IV was getting put in. I was looking the other way and Kent was rubbing my arm to console me. I was in so much pain and to lay down it was a struggle. But I had to get the CT scan done. All I remember is Kent looking down at me with tears in his eyes telling me to try to breathe and try to get calm, so they can get this scan done. Kent for the first time had that look of fear in his face just like Max. And, all the imperfect things we have done to each other in our marriage didn’t matter at all anymore. In that moment of him looking down at me seeing me in pain, not being able to breathe made Kent grab on to new heartstrings that were being pulled and tied together with mine forever. We experienced a new level of love that was far deeper then that first day he took my hand in marriage. Isaiah 54:8 I will show you my love forever. After my CT scan I was RUSHED over to the ER. The nurses and doctors were waiting for me at the door. What was happening was my right lower lung was collapsing. This is called a pulmonary infarction. Very Painful! So, yes my lung was collapsing during Max talent show. I was in the hospital for 5 days. And, one of these days was Mothers Day. This would probably sum up why I have hesitation. For 7 months the only thing I have heard from every professional in the medical field is how these blood thinners “have been saving my life.” And now my safety net would be gone. They weren’t there sitting with me looking at my children with me, having the fear of their worst fear coming true. And, the questions going through my head of, how would my husband do this without me….? I’m I dreaming….I am frighten by this load I now bare but, before my head agrees that this is not a dream I’m on my knees crying to God that you are with me every step. I’m holding your hand Lord. Lord, did you wrap yourself inside the unexpected to show me just how far Your love will go? Every moment You have been with me, and I know I haven’t traveled this journey alone. But, I’m not brave I’ll never be, I’m just a girl, Your girl who’s willing and waiting on you, Lord. And, all I have to offer is my heart. I will hold you now, and You will hold me in the middle and forever. Help me be a warrior not just a mere shadow. Even though I’m trembling hard within I trust You. I’m banking on Your promises Lord. I am treasured, sacred and I am His. I offer all that I am to You, please help me be strong. Pour over me Your holiness…. “Your life is better without Coumadin, Tahny” is the words Dr. Leppert said to me when I knew he was picking up on my new found hesitation to rip off this band aide. He has been wonderful talking with Kent and I through this whole situation. He is another blessing through this journey. These are the words I tell myself now, At this point if my clots are gone the Coumadin is only a poison. Ok, life goes on….I’m ready. 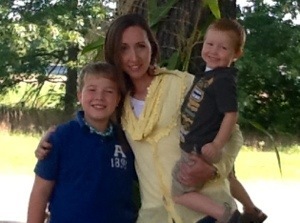 Tomorrow my heavenly Father will be holding and patting my hand as I walk in for my CT scan. My appointment is November 20th at 10:30am. Please pray for me I’m nervous for whatever the outcome is. But, please pray they are gone. I love you all and I will keep everyone posted on the results. I know the Good Lord is holding your hand Tahny. YOU will be just fine. I am praying for you. Now really girl! has he ever let you down? Stop making me cry!!!! And this song came to mind when I read this latest chapter…for you Tahny!! I love you Tahny Lee. My prayers, positive spirit and energy are with you tanzo! My prayers are with you Tahny!! Good luck tomorrow!! Tahny, I wish I could hold your other hand tomorrow! I am praying for you ALL day but I know whatever the outcome is, you are going to be ok!! PARTNERS!! Forever and ever!! I wish you never had to go through this situation too, but I sure am glad we went through it together. I love you, beck. Praying for you tomorrow and always! My thoughts and prayers are with you as well! Oh Tahny, you are in my thoughts today. Be strong and remember we all have the presence of God in our lives and all will be good. I am thankful for such a strong sweet friend. I love you! Well, prayers are going up.� How did it go?????????????? ?